In The Catskills, NY, the bursts of color in the trees are disappearing as the leaves fall to the ground. But even if autumn is quickly fading, nature is still making quite a show at the Root 52 Gallery in the little town of Liberty. Located at 87 Mill Street, the large showroom features functional art that has been fashioned from the roots of Costa Rican trees. Vases, wine holders, and decorative bowls are among the numerous items on display. The showier pieces include benches, tables, chairs, a stunning four-poster bed, and a porch swing. Each item, which has a tag describing the type of wood it’s made from (Tigerwood, Rosewood, Purple Hearts, to name just a few), has its own unique colors and patterns. Smooth to the touch, the pieces are sleek yet rustic. The walls of the gallery display huge photographs showing how the roots are harvested in their native Costa Rica. Don’t worry, no trees were harmed in the making of these objects – the roots are taken from trees that died of natural causes or trees that were cut down long ago before the government protected them. I’d highly recommend you see these functional artworks in person next time you visit The Catskills, especially if you’re looking to furnish your home with a woodsy yet artistic flair (the prices are quite reasonable for such incredible craftsmanship). Root 52 also sells wearable wood in the form of bracelets and headbands. 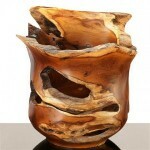 Check out the gallery’s amazing collection online at Root52.com.